The following plea was posted over on MobileRead Forums yesterday, and I'm reposting it here in the hopes that we can crowd-source the best solution and help more people. Several years ago, I gave my aunt a Sony PRS-600 reader. I was talking with her the other day, and she said that she hasn't been able to get books for it for some time. Where can she download books, now, for a Sony reader? I don't use a Sony anymore, and mostly get my books from Amazon, but Sony readers don't take the Kindle format. I already posted a response over on MobileRead, and I decided to answer the question in more detail as a post on this blog. I'd also love to hear what you think, especially if you have a Sony Reader and can relate your experiences. This is not a simple question, by any means, and I'm sure there are details that I will miss. Before we start looking for a source of ebooks, make sure that you check to see if that old ereader still works. If it doesn't work, then you don't need this post; instead you need a new(er) ebook reader. Use the USB cable to connect your ereader to your computer. If it has a separate charger, plug that in as well. Wait half an hour and then check to see if the ereader is on and charging. Also, check to see if your PC recognizes the ereader. If the ereader is still dead, then it's dead. But if your PC doesn't recognize it, ask for help in the comments (you might still have options). But if it works, great. Let's find something for you to read. Whether we are talking about the Sony Reader or another old ereader, thanks to DRM buying ebooks is not a simple process. While there are many sites like Project Gutenberg that give away DRM-free ebooks, and there are stores like Baen Books or Smashwords that sell DRM-free ebooks, the majority of new ebooks come with DRM. And that's a problem when you are trying to find ebooks for an older ereader that may or may not support DRM. 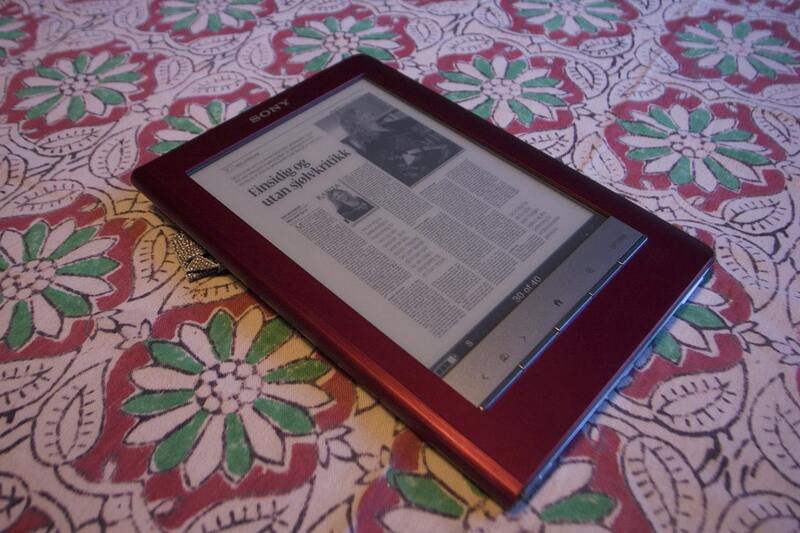 Let's look at the Sony Reader as an example. When Sony got out of ebooks in 2014, they handed their customers accounts over to Kobo and then turned off the Sony eBook Store. Sony released firmware updates for their last three Sony Reader models (PRS-T1, PRS-T2, PRS-T3) but the earlier models were simply abandoned to an uncertain fate. If you have one of those older models, or if you have another old ereader, then you have the choice of either buying DRM-free ebooks or checking to see if your device supports DRM. So here's my "one size fits most" solution. Aside from the Kindle and a few really obscure ebook readers, most ebook readers use one type of DRM from Adobe. You can check to see if your old ereader supports Adobe DRM by looking through its settings menu, or the license pages, for mentions of Adobe. You can also try installing Adobe Digital Editions app on your computer. Run the app, and then use the USB cable to connect your ereader to your computer. If the app recognizes the ereader, then you can buy DRMed ebooks from Kobo, Google, and many other ebookstores. Those books can be loaded on to the ereader using Adobe DE. If the app does not recognize your ereader, or if it can't authorize the ereader, you may still be able to read DRM-free ebooks. (Ask for help in the comments). You might also be able read DRMed ebooks, but I will have to send you elsewhere for that. Barnes & Noble has posted a set of instructions on its website which explain how to load DRMed ebooks on to the Nook Glowlight Plus. Those instructions can also be used for some other old ebook readers. I don't think this trick will work with old Sony Readers, or at least it did not work for me. The above post was originally supposed to answer just the one question posted on Mobileread, but I also tried to frame the post so that it could help anyone with an old ereader. If there's a question I haven't answered, please ask in the comments. Be sure to name your ereader model and manufacturer, so I can help troubleshoot. There is also the possibility to purchase an e-book from Kobo, Amazon or Google and strip the DRM (Google make it easier). It doesn’t require a lot of technical know-how and doesn’t take a long time to do a batch of e-books. Also, there are some, not many, publishers that will sell you an e-book without the DRM. For Mac, Calbre does support the Sony readers (I have a PRS-950) without too much drama. That is what I am currently using to manage my PRS-950. The Kobo Reader app for Mac has supported my 950. It currently does not find the 950. Seems OSX10.11.x broke that. There is little or no support from Kobo for the Mac side so you are on your own, there. The Kobo app supported the older models? That I did not know. It’s a shame that stopped working. I used Calibre with mine. It does a good job of removing DRM, which is handy when you buy a book intended for Kindle and want to read it on a Sony or Nook. Just a note. While it’s true that All Romance (and their sister site OmniLit) sell DRM free ebooks they also sell books with DRM. This makes them really no different than someplace like Kobo or Amazon which sell both with and without DRM depending on author/publisher DRM wishes. Whoops. I’ve always heard of them in reference to DRM-free. I didn’t realize that was inaccurate. One detail about the possible dead Sony reader I learned the hard way from experience. If after plugging in to charge as described it doesn’t turn on, one more thing to try is a hard reset of the device. I don’t know exactly how it is done with a PRS 600, but on the 505 I had it was (IIRC) a recessed button behind a pinhole on the back (though it may be a combination of holding down power and volume or something). I found out about this trick after I had thrown out my old Sony. Good point. One should always perform a hard reset before junking a device, because sometimes that will revive it. I added a mention, Thanks! Smashwords is another source of DRM-free EPUB books. Just to point out that its not Calibre that removes the DRM from books, but added tools from Apprentice Alf that do so. Calibre on its own will not remove DRM, nor is that its intended use. I have a Sony PRS T1, love it. However it has been getting a bit buggy (frequently freezes instead of opening the dictionary) and will not connect to the computer, although it will charge (tried different ports/cables). I have been thinking about doing a hard reset, however apparently once reset you need to authorise the ebook again. Is it still possible to do this, so long after Sony quit ereaders? I have an PRS 650 which I lost in moving many years ago. Looking vend it . Can I réactivité or is it too old no. Help. Hi there! I have a PRS T3… I managed to fully charge it yesterday… It took a while, but finally it worked. Now the only problem is that my Win10 Computer does not recognize it. It seems that windows tries repeatedly to connect the device, because I keep getting the same “Usb device not recognized” every 10 seconds. Any help is much appreciated. Windows 7 and Windows 10 do not acknowledge my PRS-T2 when I connect it via USB. The USB icon doesn’t even appear on the screen of the PRS-T2. Has anyone overcome this issue?